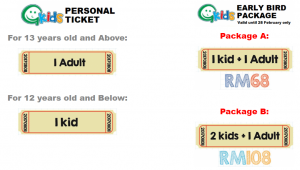 ticket by clicking the respective button. 3. Select Ticket Quantity, and click on the Add to Cart button. 4. Click on the View Cart button either on top, or on the menu header to view ticket quantity and price. 5. Click on the Proceed to checkout button if the quantity is correct. 6. Fill in the billing details. 7. Tick to accept terms and conditions. 8. Click the button Place Order. 9. 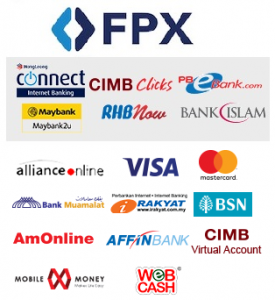 Choose the Payments Options and fill in the corresponding information. 10. Take note on the accuracy of the information. 11. Please choose your Credit Card issuance country. 13. Proceed with MOLPAY payment and check your email. Confirmation letter will sent to you in 48 hours as the payment success. **Noted that the confirmation letter might be sent into your junk mail. 14. Kindly print out the confirmation letter and bring to G-Kids counter for ticket collection.